Nordic Ware’s microwave safe dinnerware is a perfect substitute for paper or plastic disposable plates and can be used time and again. Break-resistant, these are ideal for kids, too. Whether at home or on the go, you can feel good about reaching for these BPA and Melamine free products. 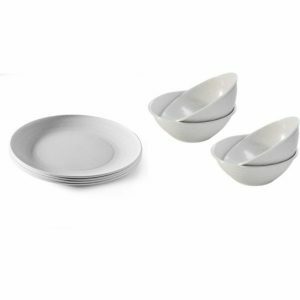 Everything you love from Nordic Ware and for your family in one bundle. All Nordic Ware products are proudly made in the USA. Set of 4 Flecked White Microwave Safe Bowls for Soup or Cereal and 4 Microwave Safe Plates for everyday dinner use. Plates and Bowls are microwave, freezer and dishwasher safe. Durable – won’t crack, chip or break. Made in the USA! An eco-friendly alternative to disposable dinnerware – BPA and Melamine free.